I have been hunting for a Jumpsuit that suits me well for over 3 months now. Why did it take so long?? Honestly, Jumpsuits are tricky for girls who are Pear or Triangle shaped. It was a painful search because even though i liked a lot of Jumpsuits while they were on display and hated it on me. I am not complaining here but lets remember the reality that not all styles are made for all body types. I definitely think Jumpsuits is tricky for bottom heavy women with thunder thighs and big hips. Finally this painful search ended when I saw this Black Chiffon Jumpsuit. I thought to myself no matter how it looks I am going to buy it. I tried it on and to my surprise it looked just fine. They say Jumpsuits are not made for short and heavy women, so they say... right ;) ?? What I did discover is that Jumpsuits can be versatile and can be styled in more ways than I could imagine. I would love to share the different 12 looks I created with the SAME Black Jumpsuit in this video. These looks are created for different occasions and seasons. I am very excited about this vlog and wish to hear your feedback, both compliments and complaints are entertained. After all 'Criticism is prejudice made plausible'. Loved all the looks…esp where you added a blazer..so chic! PS - you are so pretty! Thanks Shubha :) u r so seeet ! 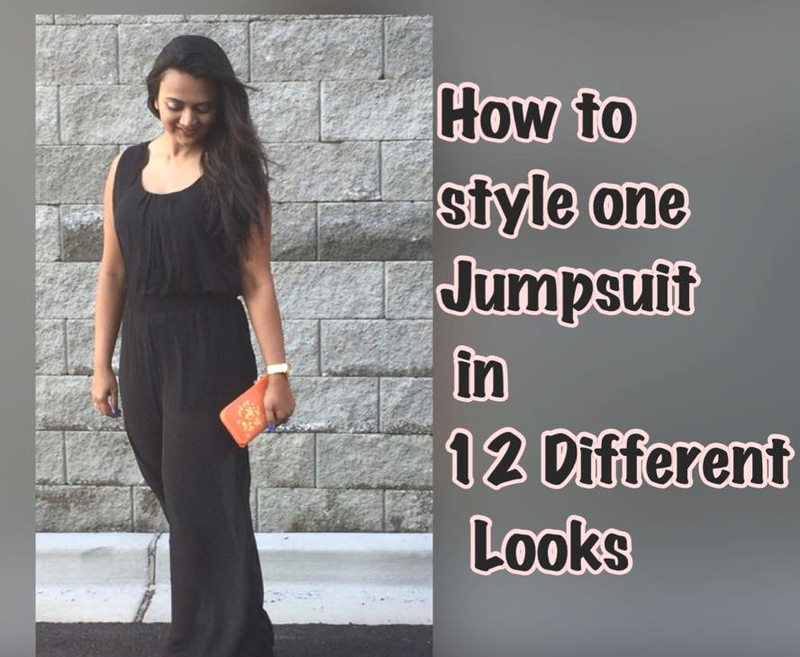 awesome tips on hot to wear a jumpsuit in so many different ways! Thanks :) Sure wil check it out ! Who knew there were so many way?! This is awesome! I love the video-- so cool. Great tips and Great looks doll!!! Lovely one :) Black, chiffon - it all adds beautifully! This is awesome, thanks for sharing ! Beautiful, very creative, great video, doll. Hi lovely, I am not a fan of jumpsuits I think they do not look on me but after seeing you video I many get one! thanks. I never would have thought of these 12 different ways to wear one jumpsuit. So cute! Incredible! This is such great inspiration! I was so much on the fence about jumpsuits and finally very recently got one in Black Chiffon. Indeed they are super versatile. Love your various OOTD. These are great tips! Love wearing jumpsuits in the summer. interesting ways to style..never been a jumpsuit girl..this looks inspiring..i wonder if you'd get the same effect with a printed jumpsuit..
good download Videoder , which is now one of the best apps official website any particular video just selects the quality in which we want to download. Videoder APK Download great.